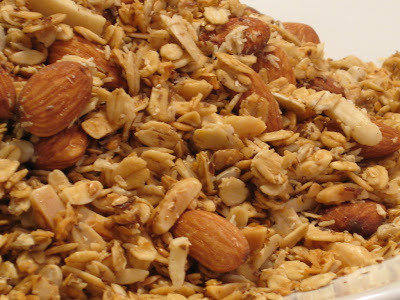 I am (hopefully) (maybe) (possibly) going to make Granola tonight. Jen wishes she could, too. But she is waiting for my recipe. Grandma Janelle's recipe, that is. So I thought I would share it with all of you. Because I know you are going to love it once you put the time into making it. Heat the oil and honey together. Add the vanilla. Pour over oats. Mix thoroughly. Spread a 1/2 inch layer on a cookie sheet. Bake at 300 for about 30 minutes. Or until lightly browned. Stir once during the 30 minutes. Have fun! It is a delicious basic recipe to which you can add all kinds of other yummy stuff. I will eat it for breakfast, lunch, dinner, and my midnight snack. Yumm...Thanks for sharing the recipe!